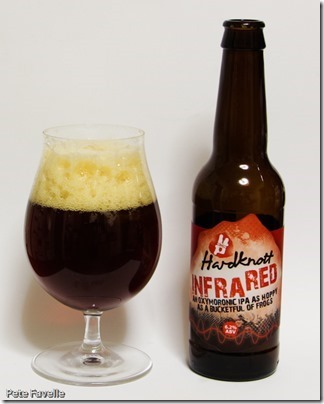 I was pleased to see Hardknott in the list of this year’s beers, because I’m something of a fan. If nothing else, you can be fairly confident that they’re never going to release a boring, bland, feeble golden ale with a couple of Cascade hops waved over the bottle. Infra Red is a 6.2% ABV “oxymoronic IPA”; it’s nice to see the folk at Hardknott embracing my own discomfort with the overuse of the term “IPA” to cover every shade of beer under the sun. It’s certainly red; a gorgeous, deep dark red with a deep, foam-filled head that makes fitting the whole bottle into the glass a challenge, despite being one of the few 330ml bottles in the collection. The nose is heavy with American hops – more leaf and resin than floral citrus – with a hint of alcohol, a touch of maltiness and a faint orange fruitiness. In the mouth, a nice caramel sweetness greets the tip of the tongue along with some alcohol heat. A slightly plummy dark fruit tone then comes in and slowly yields to a long lasting, faintly citrus, bitter finish that just keeps growing in your mouth even after you’ve swallowed. Quite, quite magnificent and something that deserves to be permanently in any self-respecting beer cupboard – 4.5 stars.